Will pressure from the United States, fear of losing the last dollar correspondent account and an impending vote on admission into the OECD finally force Latvia to curb the laundering of dirty money for shady figures from the former Soviet Union via Latvia’s non-resident banks? Last autumn two heads of influential security committees of the Latvian parliament had a rather unpleasant conversation with high ranking Treasury official in Washington. “Although your country is small, and your administration is small, the amount of dollars going through your financial system is one per cent of all U.S. dollar transactions in the world. That’s hundreds and hundreds of millions. You must be able to control it. How you do it is up to you,” Ainārs Latkovskis, head of the Latvia’s parliamentary Defense Committee, said in an interview with Re:Baltica, recounting a conversation with Treasury’s Assistant Secretary for Terrorist Financing Daniel Glaser. A similar message awaited Latkovskis and Solvita Āboltiņa, head of the National Security Committee, at the Department of State. 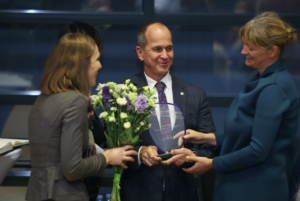 The need to finally start seriously clamping down on the stream of dirty millions flowing through Latvia, mostly from the former Soviet Union, was constantly mentioned by the new U.S. ambassador in each of her introductory visits to Riga. It was also brought to the attention of Latvia’s Minister of Foreign Affairs by close associates of the U.S. Secretary of State. In January, 2016, the subject was raised in the U.S. Congress. When speaking about the $1 billion stolen from Moldova and the three Latvian banks, Congresswoman Sheila Jackson Lee said: “These banks appear to be financial institutions controlled by associates and friends of Russian President Vladimir Putin who have a demonstrated history of plundering the national treasuries of the former CIS countries.” She called upon the White House and the Congress to investigate whether the funds end up in the hands of terrorist organisations. The risk now is for the country to be slapped in the face with a “no” from the Organisation for Economic Co-operation and Development (OECD) which Latvia is eager to join, as well as the possibility of losing its last dollar correspondent account in a western financial institution that’s still cooperating with Latvian banks, and pressure from the U.S. are the reasons why the political elite and the banking supervisor of Latvia have suddenly awoken from lethargy. Ten years ago similar pressure from U.S. on Latvia to get its act together ended in two banks locked out of the U.S. financial market (VEF banka had its license revoked, Multibanka underwent several changes of ownership and names, but until the EU/US sanctions on Russia were imposed they were controlled by Rotenberg brothers, childhood friends of Vladimir Putin). In 2005, promises were made to clean up the banking sector and laws were altered to demand that banks identify owners of offshore accounts. Aigars Kalvītis, then Prime Minister, criticized the prosecutor’s office and created a special council to oversee developments, with himself as the head. The structure last met two years ago, in February 2014. Ten years later Latvian banks appear as laundering intermediaries in high visibility cases involving countries of the former Soviet Union. Latvian banks transferred dollars defrauded from the Russian state budget, which were investigated by Hermitage Capital lawyer Sergey Magnitsky, who later died in prison. The dollars of Serhiy Kurchenko, a self-declared billionaire and associate of Viktor Yanukovych, the overthrown President of Ukraine, that Ukrainian law enforcement is chasing around the world. 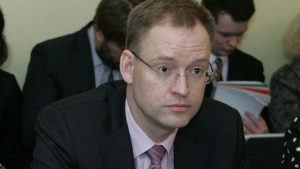 The illegal procurements of “Russian Railways” which were exposed by a Reuters investigation. The latest scandal is the billion siphoned out of three Moldovan banks. The political elite of Latvia did nothing but looked on – as did the bank regulator (FCMC). Out of almost 150 employees in the banking regulator just 3 – 5 people were directly tasked with fighting money laundering. Before May 2014 the largest fine the regulator could impose on a bank was EUR 142 000: a small risk compared to the profits of banks. Neither FCMC nor the lawmakers proposed to increase it. Much larger fines – up to 10% of a bank’s net revenue (which would realistically be from 450,000 euros up to 18.5 million euros) – were only introduced because the EU adopted such a law. Only after this law was it mandatory to name banks that were punished by the regulator, previously the regulator claimed financial stability would be threatened if people knew which banks were fined. Action started towards the end of 2015. First, Privatbank was fined a record sum for its role in the theft of the billion of Moldova. In January 2016, the regulator imposed significant restrictions on Trasta komercbanka, prohibiting its existing clients from making transactions with amounts exceeding 100,000 euros (both banks deny wrongdoing). . This move was followed by the resignation of Kristaps Zakulis, head of the regulator. If he hadn’t left voluntarily, the Minister of Finance and the head of the Bank of Latvia were ready to seek his removal in parliament. Riga’s political elite were seized by fear that the flexible attitude towards money laundering could be a reason to reject Latvia’s bid to join the OECD. Another possible risk feared by the Bank of Latvia was the closing of the U.S. dollar correspondent account with “Deutsche Bank” – the last western credit institution that still cooperates with Latvian banks (DB declined to comment). The former would be a smack in the face of the international reputation of the country. The latter – a blow to the non-resident bank business model, as intermediaries in Asia or elsewhere would have to be involved. That would slow down business and make it more expensive. “We continue to look to Latvia to do more to protect the integrity of the U.S. and international financial systems. We will continue to enforce and pursue action against banks anywhere that present money laundering concerns and risks to the U.S. financial sector,” U.S. sources involved in the case told Re:Baltica. 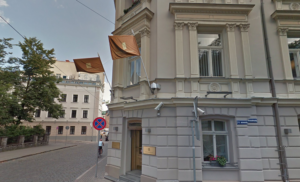 The response of the U.S. Department of the Treasury was more diplomatic: it regularly encourages countries to establish strict supervision and actively control it, and that applies to large European financial centres, including Latvia. Since the restoration of independence 25 years ago an unusually large banking sector for a country of 2 million has developed in Latvia. Thirteen of 17 banks work mostly with non-residents. They own over half of all funds deposited in the banks. It’s a risky, but very profitable business for their owners (two of the three biggest banks in Latvia in recent years are ABLV and Rietumu banka that cater to a non-resident clientele). Historical connections, knowledge of the Russian language, understanding of the Russian mentality, and willingness to engage in risky and fraudulent dealings have attracted clients mostly from ex-USSR countries, 80% of the non-resident bank clients come from CIS countries. U.S. attention to the Latvian banking sector has always been present in diplomatic talks, but its relevance started to grow after Russian backed aggression in Ukraine, when the assets of Russian and Ukrainian officials subject to sanctions were being chased around the world, diplomatic sources with detailed knowledge of the situation revealed to Re:Baltica. “Latvia presents itself as a financial centre, but Americans say: each financial centre dealing with international transfers in dollars must invest adequate resources in banking control. It’s not just a matter of business, it’s a matter of national security,” says Andris Razāns, the ambassador of Latvia to the U.S.
Kristaps Zakulis, the head of the bank regulator, was summoned to the highest level security meeting – the National Security Council, chaired by the President – twice in a short period of time, in September and December 2015. Nothing similar had happened before. The guests and agenda of the council meetings are classified, so no official information can be obtained on the subjects discussed. 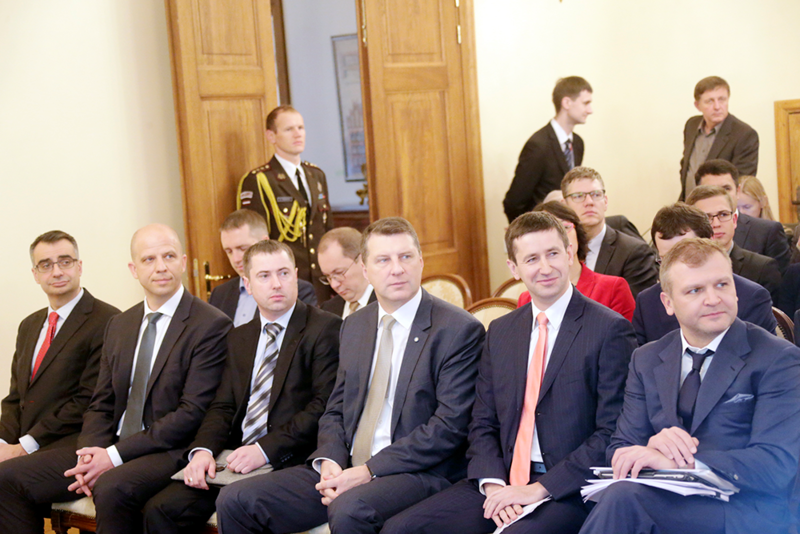 Before Christmas Zakulis was criticized in the parliament committee overseeing the regulator. Suddenly faults were found in the work of the FCMC, additional staff members were promised (to bring the total to eight), and regular reports to MPs were demanded. Talk of replacing Zakulis was only silenced for a while by the collapse of the government. “Laws are always in the centre of attention, because they are obvious and allow actions to be manifested. But if there is not enough enforcement, it doesn’t matter how strict the regulation is,” says Mark Galeotti, professor at New York University, who together with his colleague Andrew Bowen analyzedthe money laundering situation in Latvia a few years ago. In November 2015 Galeotti spoke of the relations of the West and Russia in the annual Riga security conference. He urged people to take a look at the laundering of money illegally obtained in the countries of the CIS from a national security perspective, and ask: which side is Latvia on? One of the reasons the parliament committee called in the regulator to the hearing was an OECD experts report on the accomplishments of Latvia in combatting bribery, including laundering the proceeds of it. “Latvia has significant exposure to corruption and foreign bribery-related money laundering due to a high proportion of non-resident clients in the banking sector,” the report said. Both the bribery case of Kyrgyz officials, including the President, who received money from a Canadian company via an unnamed Latvian bank, and the case of bribing Russian officials with the help of a German intermediary and Latvian banks, admitted by Hewlett-Packard, were mentioned. 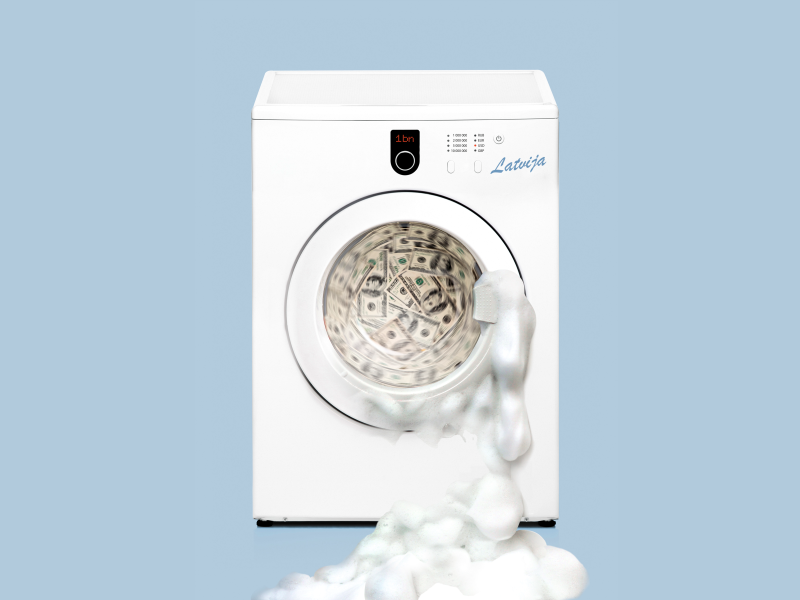 The OECD concluded that the existing supervision system has failed to detect several large-scale laundering transactions and instead has found out about them from the press. The penalties imposed have been disproportionately small, the legal requirements for banks – insufficient, inspections – too few and far between, and the supervisor: weak. In an interview with Re:Baltica Zakulis disagreed and quoted the Council of Europe Moneyval assessment, which concludes that institutionally and regulation-wise Latvia has done what’s necessary to prevent money laundering. He mentioned sending a permanent FCMC advisor to the U.S., tasked with maintaining communication between both countries. Arnis Lagzdiņš, the man appointed for that job, was touted to the press as well-educated and experienced ex-World Bank employee. It was not mentioned that Lagzdiņš was also the vice president of Parex Banka, a bank whose collapse in 2008 pushed the government to seek an IMF loan, but before was the crown jewel of the non-residential banking. FCMC, feeling the heat, announced harsh sanctions just two working days before the impending critical meeting at parliament: a two million euro fine for Privatbank, a demand to change the bank’s board, and individual fines for the board members. The next act of the same play involved the State Police. A couple of days later the police reported apprehending two employees of Trasta komercbanka (TKB) for possible laundering in another case. 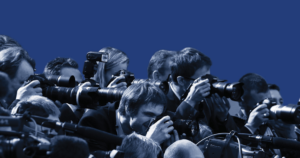 However, both the report and the experts interviewed by Re:Baltica confirm that the problem is not in the laws of Latvia, but in the unusually pliable attitude of the regulator and law enforcement personnel. The average police officer or an unspecialized prosecutor, whose best understanding of a financial scheme is making ends meet before payday, has no hope – or desire – to figure out schemes conjured by dozens of lawyers and consultant offices. With parliament considering deeper checks of banks customers and an increase in fines for money laundering offences being proposed by the Ministry of Finance, the non-resident bank lobby has stepped up activities too. The ideas are delivered to the parliament by the bank and entrepreneur associations, as well as the new think tank Certus, chaired by the once promising academic and politician Vyacheslav Dombrovsky. Its first report on Latvia’s competitiveness practically proposed that Latvia should be off-shorized. The authors recommended luring the offshore companies that use Latvian banks to Latvia by offering them exceptionally favourable tax rates. Company tax of less than 2 percent was proposed (the regular rate is 15%), two years of tax holiday (up to 200,000 euro) for companies that re-register in Latvia and do not exceed a turnover of 50 million euros, and up to a five year exemption from the pension part of social insurance. The Certus board includes the former ambassador and Minister of Foreign Affairs Aivis Ronis, who has worked as a non-resident bank representative, Deputy Chairman of the Board at ABLV Vadims Reinfelds, as well as the head of the Association of Latvian Commercial Banks Mārtiņš Bičevskis. Dombrovsky refused to discuss the sources of funding, only saying they are 100% private and the same that supported the competitiveness report produced by the think tank. Of the supporters mentioned in the report Re:Baltica got confirmation only from the bank association and Lattelecom (the rest denied it, except LNK Industries which did not answer). ABLV, unofficially mentioned as the main source of funding for Certus, refused to answer the question and suggested to address the question to the think tank.